Set in a pastoral setting in St. Albans, this development will be located within easy access of I-89, making downtown Burlington a very manageable commute. This development will consist of 26 townhomes. Contact us to inquire about availability. 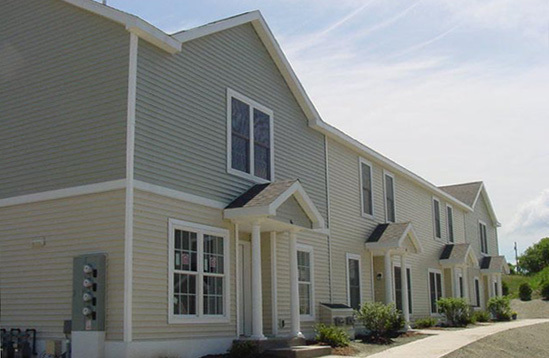 Pine View Estates town homes offer a large living space at an affordable price. These homes have plenty of windows to let in an abundance of natural light. The first floor has an open plan and the large kitchen offers space for eat in along with a breakfast bar, the dining living area adds to the spacious feel. The second floor bathroom with a laundry makes this a convenient and practical location that directly accesses the Master bedroom. The second bedroom also has its own walk in closet. The optional finished basement with above grade garden style windows creates additional well lit living space.